5Pcs 3.7V 600mAh 25C Lipo Batteries for Syma X5, X5C, X5SC, X5C-1,X5SW and Cheerson CX-30W RC Quadcopters. • 5x3.7V 600mAh LiPO rechargeable battery replacement, no modification needed! Powerextra 5Pcs 3.7V 600mah Rechargeable Li-Po Battery with 5-Port Quick Charger. Exact Replacement for Syma X5, X5C, X5SC, X5C-1,X5SW and Cheerson CX-30W RC Quadcopter Drone,no modification necessary. Charger Voltage input: DC 5V; Voltage output: DC 4.2V; Charging 5 battery at one time, Over charge protection, Short circuit protection. 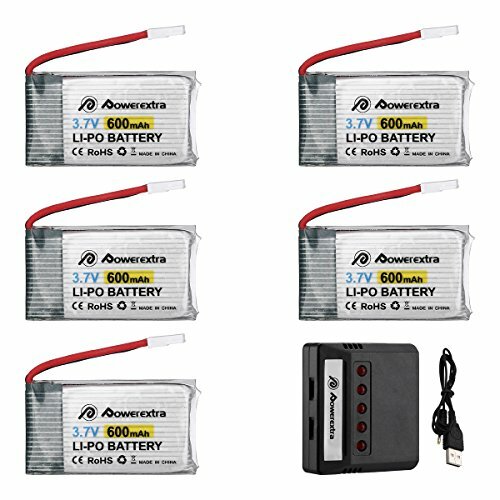 Package include:5pcs Powerextra 3.7v 600mAh LIPO Battery,1*5-in-1 Charger.